And, dying so, sleep our sweet sleep no more. 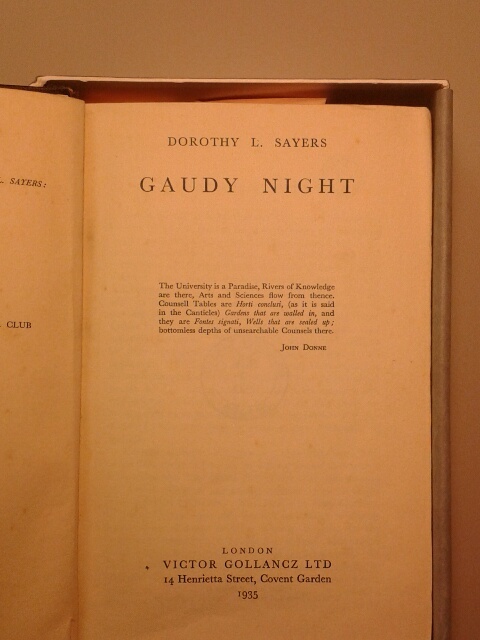 As many readers will have noticed, the sonnet is from Sayers’ novel Gaudy Night; Harriet Vane writes the first eight lines and accidentally leaves them in a bundle of papers about the case, later finding that Peter Wimsey has stumbled across it and added six lines to make it a sonnet. They may also have noticed that there’s something slightly odd about this text. The first line of the sestet reads “that me upright” where I expected “that we upright”. I slung a quick email to the other participant in the wedding, pointing out the mistake so we could note it on the proof version when we sent it to the printers. To my surprise she replied that she’d checked it against her e-book and the reading was definitely “me”. I reached for the hardback Folio Society edition on the shelf next to me and found it read “we”, as I had always thought. Relieved to find I hadn’t necessarily been reading the poem wrongly for the last twenty years, I speculated that the transcription error had been caused by faulty Optical Character Recognition during the making of the e-book. OCR is a process via which a computer “reads” printed pages, turning them into machine-encoded text which can then be stored or reproduced. It picks up on the shapes of the letters and words on the paper (depending on what kind of OCR is being used) and translates them into the code which is equivalent to that word or letter. (A useful process to reflect upon when thinking about how we ourselves jump from a set of black shapes on paper to the idea of dog, or quickly, or ultramontanism.) Since obviously this process focuses on the shape of the word, “we” and “me” could be mistaken for each other. The fact that they also have a similar sound and are both pronouns muddies the water rather, as those could be contributing factors if we were looking at a document which had been taken down from dictation or transmitted via a paraphrase. Those aspects couldn’t affect OCR, however, and my speculation was based on the similarity of shape. 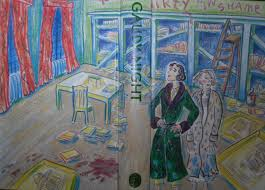 Half-way through an email about the OCR solution, though, I realized I had two other copies of Gaudy Night in the room. (It’s possible that this book is over-represented on our shelves.) Looking up the relevant passage in paperbacks printed in the 2000s and 1980s yielded “that me upright”, the same variation I had just ascribed to a computer sometime in the last decade. Clearly that couldn’t be the case. Even if there were editions based on the e-book text (which would then preserve the “me” variation), they couldn’t have existed back in the 1980s before OCR was used to create e-books. Consulting the front-matter of all the copies in the room, I discovered that both paperbacks were based on an edition published by the New English Library in the 1970s, and the Folio Society hardback had used the 1935 Gollancz text “with minor emendations”. This suggested a couple of possibilities: that the 1935 text read “we”, and “me” was a variation which had been introduced sometime between it and the paperbacks (perhaps in the typesetting 1970s New Library Edition); or that the Gollancz text had read “me” and this had been emended to “we” during the creation of the Folio Society edition. That seemed a perfectly possible emendation for the same reason that I had assumed the service sheet contained a typo: “me” doesn’t make grammatical sense. I had always read the word as “we”, which makes it the pronoun the subject of the verb “sleep” in the third line of the sestet. 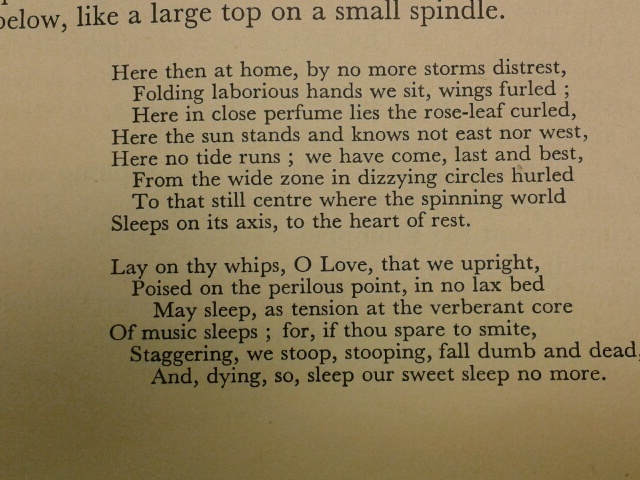 According to this reading, the sense could be paraphrased as “Lay your whips on, Love, so that we may sleep upright in a bed which is not lax, posed on the perilous point”. (Proof right there that paraphrasing poetry is never a good idea.) The gap between the subject (“we”) and the verb (“may sleep”) is a whole line, and requires the reader to hold the meaning suspended as the clauses unravel, but this is not unexpected in poetry. Particularly poetry jointly written by two characters in a novel by Sayers, all three heavily influenced by Donne and (as Lucy Allen kindly pointed out in the past) Dante. If the word is “me”, it not only changes the pronoun but the function that word has in the line. During a discussion via email and on Twitter, both Sheenagh Nixon and Lucy Allen said they had always seen it as the object of the verb, not the subject. The verb in question being “upright”, not “may sleep”. In other words, the paraphrase would run “Lay your whips on, love, the whips that make and keep me upright as I am poised on the perilous point, so that we/I may sleep in a bed which is not lax”. “Upright” changes from being an adverb describing how the sleeping takes place to a verb happening to the speaker. It’s not standard usage, but neither is leaving a verb far away from the subject, or writing in iambic pentameter. This reading makes the line rather more linguistically creative, putting it alongside similar unexpected verbings such as Gerard Manley Hopkins’ “Let him easter in us”. The implications of “upright”, given that the speaker (or at least the writer) of the sestet is male, are further altered if the word is a verb rather than an adverb. It would make perfect sense for Sayers to produce an innuendo, given both the influence of Donne and the fact that her work shows she wasn’t averse to that kind of linguistic play elsewhere, such as a mention of a “virile member” in ‘Are Women Human’? So both meanings make sense, but shift the implications of the line somewhat. There is a grammatical objection to “me”, namely that if it is not a subject but an object, what happens to the verb “may sleep” a couple of lines later? It is left without a subject. However, as both Sheenagh and Lucy pointed out, this is hardly unprecedented in the compressed and pressurized language of poetry. There are parallels, if not precisely of the same form, in a poem like Donne’s ‘Nocturnal upon S. Lucy’s Day, Being the Shortest Day’, where some grammatical compression seems to have taken place in the lines “Were I a man, that I were one,/ I needs must know; I should prefer,/ If I were any beast,/ Some ends, some means; yea plants yea stones detest”. Lucy even suggested that the omission was particularly apt for Peter Wimsey to have made, since “he thinks in Latin”, and in that language the form of the verb would have supplied the subject for “may sleep”. The conceited and Latinate form of the verse would make the reading not only explicable but even preferable. In formal terms there is a case for “me” as well. It would be the only use of “me” or “I” in the whole poem, which otherwise concerns itself with “our” feelings and experiences. But this is the first line of the sestet, a traditional point for the poem to take a turn (or volta), and within the narrative this is the moment where Wimsey’s voice enters the poem. That “me” could well be the pivot on which the poem moves, introducing the singular number as a way of pointing out that the octet (which is also the original poem) speaks of “we” and “our”, and there is a counter-narrative to be expounded. That universal “we” resonated with Harriet’s near-ecstatic vision of the scholarly life, and her possible place in it after her wearing experiences, in which the promise of Psalm 85 might be fulfilled, “mercy and truth are met together, righteousness and peace have kissed each other”. But “me” would insist on her not losing herself in that general rest, but keeping her emotional identity as part of a (potential) couple, and make the “we” of the final lines the pair of them. This solves the problem, though in a way which I must admit leaves a little regret behind. If the first edition had read “me”, there would have been more doubt as to Sayers’ intentions; one more grammatically correct reading and one more compressed and oblique version would have co-existed. “We” would be a logical emendation It looks as if “me” is an error in typesetting, but one which has nonetheless produced an intriguingly altered poem in the editions where it is printed. And is there in any case a hint of the end of Proverbs 24 in those hands folded for rest in the earlier lines? “Yet a little sleep, a little slumber, a little folding of the hands to sleep: So shall thy poverty come as one that travelleth; and thy want as an armed man”; just at the moment when rest appears to have been achieved, need and lack burst through agonisingly. Ha! My copy had ‘me’ and I always assumed it was part of why she objects to Peter finishing the poem – typical man, it’s all about him! I’m really struggling to change my reading in my head. There is a second possible (equally erroneous) reading if ‘me’ stands – that is, paraphrased ‘lay on thy whips, that may me sleep upright’. Instead of ‘upright’ as the transitive verb for which ‘me’ is the object, ‘sleep’ becomes transitive. This gets rid of the problem of the missing subject in line 11, and has quite a nice Elizabethan feel to it (since we’re thinking about Donne); I’m not sure you can have an ethical dative within a subjunctive clause, but it’s close enough! Erroneous, perhaps, but nonetheless superb. Many thanks for this. About halfway through reading this post, I went back to the book to read when Harriet discovers the sestet, and tried to glean which meaning Sayers intended. Sort of interpretation by proxy i.e. using Harriet’s pov as the lens through which to read the sestet. Alas, I didn’t come to any conclusion.